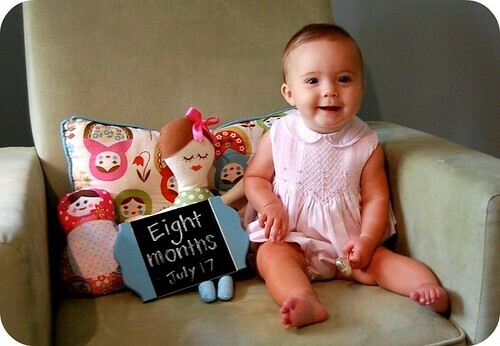 On the 17th, Lael turned 8 months! Every month I find myself saying, "THIS is my favorite age." Yet, when the next month rolls around I'm repeating the very same thing. "You hem me in- behind and before; you have laid your hand upon me. Such knowledge is too wonderful for me, too lofty for me to attain." 8 is currently my fave also...still such a baby but learning more and more each day...Tear! Why do they have to get big so fast? she's such a presh lil chicken :) can't wait to see yall again soon!